After the rain overnight and some icy temperatures﻿, the melting ice on the Old Man’s Beard lichen and the ice coat clinging to the branches made for a beautiful scene outside my guest room window. To add to the show, a stray reflection of sun projected dazzles of light on the garage doors. On our drive to Black’s Harbour this past Monday, we took the cross-country highway #785. It travels directly to the southern part of the province through the woods. Many streams cross the roadway. 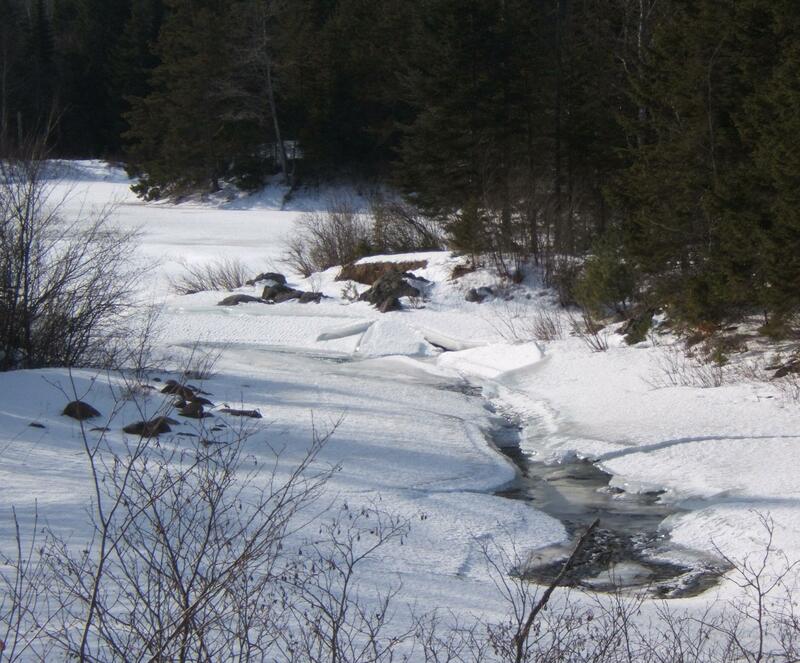 All are lined in snow, but the center channel is just a sheet of ice away in most streams and rivers. In some cases, the water is moving so swiftly, the ice has been breached by the flow. The result is a carved ice-world of frozen water. At these openings in the frozen river, you can catch a glimpse of the winter water-scape: the layers of ice, the icicles and frosted caverns beneath the smooth upper layer of ice and snow. 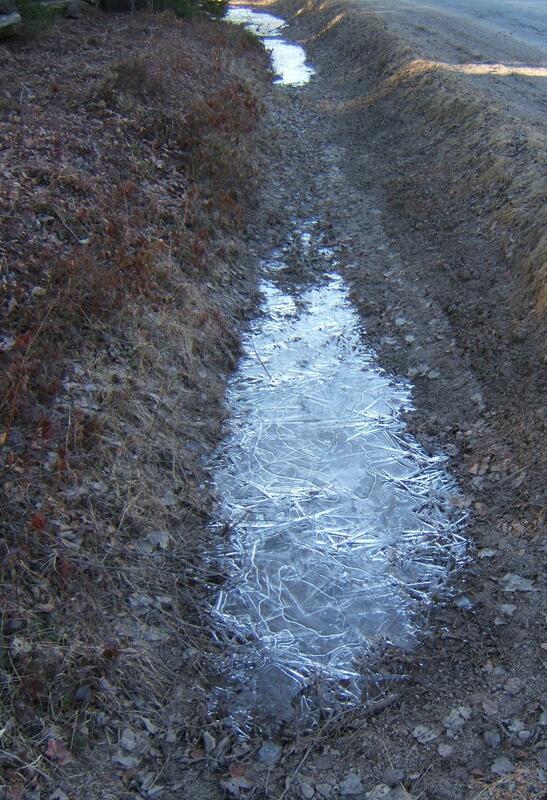 When nights are icy cold after a day of spring warmth, water freezes in the ditches. 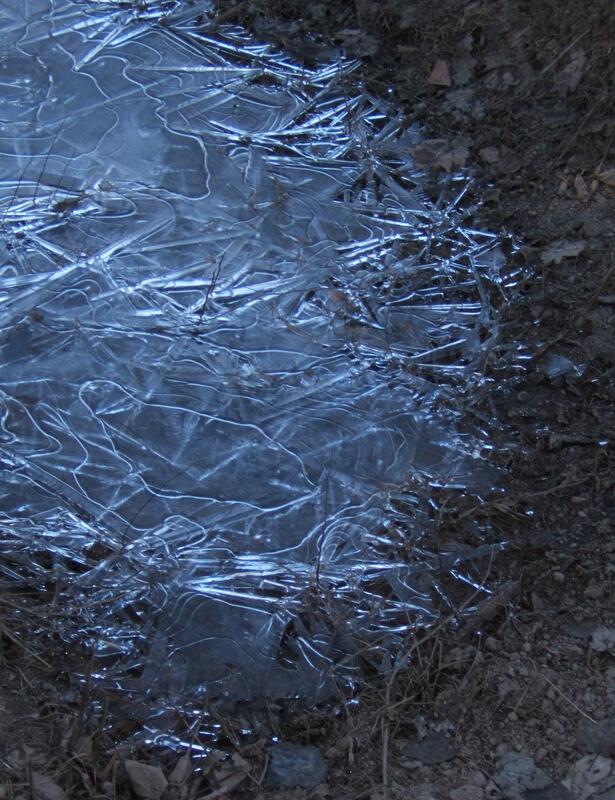 Ephemeral, this skim of new ice will be gone as soon as the morning sun overtops the trees. The ice is frail, but if you are careful, you can lift a pane of this natural glass and see the world through a different window. Our snow is slow in coming this year. We have had three snowfalls, but each, in its turn, has been rained or warmed away. If our ups and downs of temperature continue, the scant layer of snow on the ground this morning will be gone by Saturday. However, winter is manifesting itself in other ways. I am wearing another sweater-layer this week. Our grey woods are muttering with chill cracking sounds. 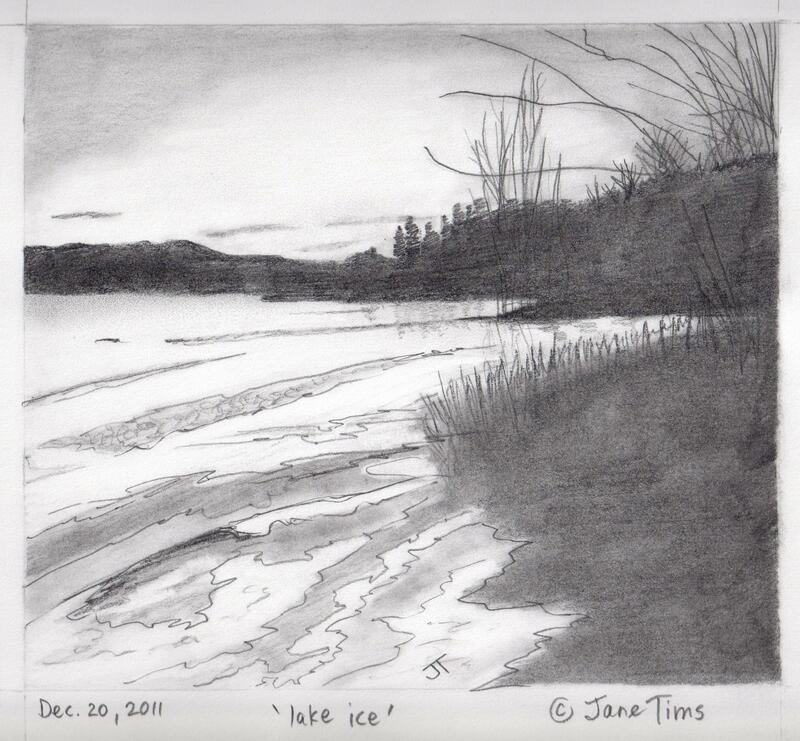 And ice is forming on the river and along the lake edge, gradually covering the surfaces with white and grey. Ice – the frozen state of water… water is critical because it is a key component of our ecosystem and we need water to drink. Also, an unusual property of ice is responsible for keeping our ecosystem healthy. Frozen water is about 8% less dense than liquid water. This means ice floats. 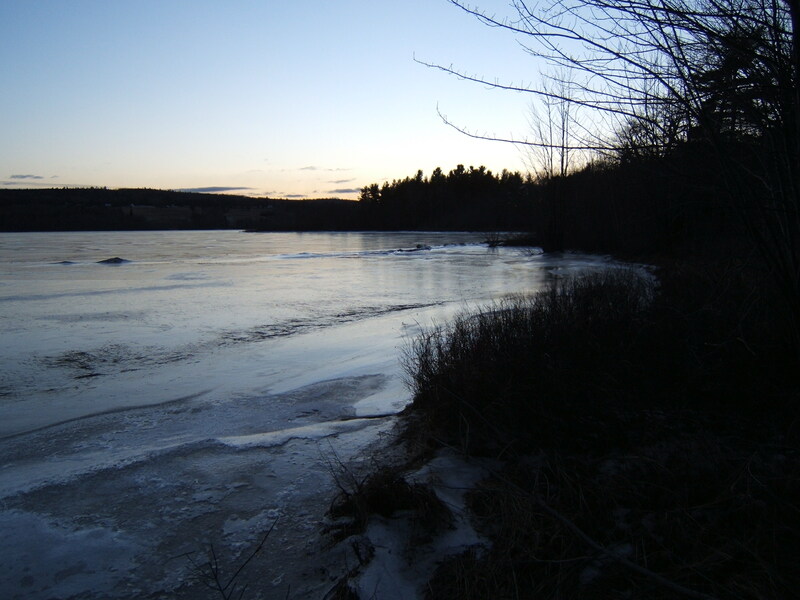 As a result, bodies of water such as rivers, ponds and lakes, do not freeze from the bottom up. Instead, when water freezes at the surface, critical habitat is left under the ice for living things to survive and thrive. This is especially important for the bacterial and algal colonies at the base of the food chain.